Iridium - 77Ir Your user agent does not support the HTML5 Audio element. Iridium has two isotopes, Ir-191 and Ir-193 and both are used in the production of radioactive material. Ir-191 is used for the production of radioactive Ir-192. This Ir-192 is used as a radiation source in gamma cameras that are used for non-destructive testing. Ir-192 sources are also used in so-called brachytherapy procedures whereby radioactive materials are placed in close contact with the tissue being treated. Although Ir-192 can be produced from natural Ir, the use of enriched Ir-191 gives a much higher specific activity and allows the use of smaller sources. The use of Ir-193 has been suggested for the production of the therapeutic radioisotope Pt-195m. This table shows information about naturally occuring isotopes, their atomic masses, their natural abundances, their nuclear spins, and their magnetic moments. Further data for radioisotopes (radioactive isotopes) of iridium are listed (including any which occur naturally) below. 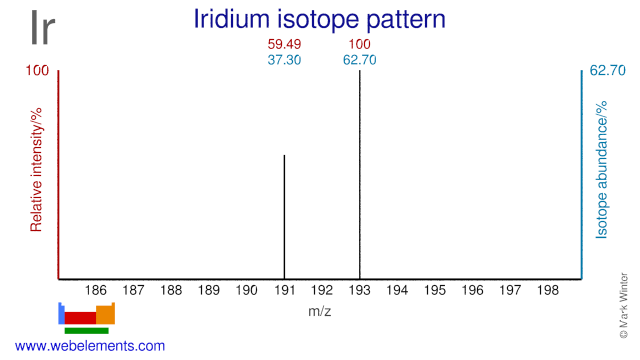 Isotope abundances of iridium. In the above, the most intense ion is set to 100% since this corresponds best to the output from a mass spectrometer. This is not to be confused with the relative percentage isotope abundances which totals 100% for all the naturally occurring isotopes. Further data for naturally occuring isotopes of iridium are listed above. This table gives information about some radiosotopes of iridium, their masses, their half-lives, their modes of decay, their nuclear spins, and their nuclear magnetic moments. Common reference compound: no defined reference.